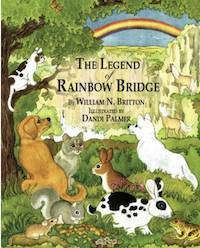 The Legend of Rainbow Bridge is a beautifully illustrated book for "children" of all ages. In this book William N. Britton relates his and Savannah's journey to a Native American school to speak to the children, and where he meets a Shaman. (Savannah is his companion German Shepherd.) He retells the tale of the Shaman of the place that beloved companion animals go when they die to wait for their human companion, so that together they can cross over Rainbow Bridge into heaven. All humans and other animals were created by God as living souls, and as such we all enter the spiritual realm, hopefully heaven, when we die. The Legend of Rainbow Bridge gives us a legendary way of understanding our reunion with our furred, feathered, and scaled children. The Legend of Rainbow Bridge is intended to help heal the loss we feel when a beloved companion animal dies, and to give us the hope of being with them again. William N. Britton knows all about the therapeutic effect companion animals can have on a person. Bill, along with his wife Mickie, founded the Companion Golden Retriever Rescue (CGRR) in West Jordan, Utah. Together they rescued and adopted out abandoned and abused Golden Retrievers. Since 1988 the CGRR has rescued thousands of dogs and found loving homes for all of them. Many of their dogs became companions to handicapped veterans. In his spare time, Bill writes stories for children's books about animals. This book is dedicated to Mickie, who died on 1 January 2002. Dandi Palmer has been an illustrator for more than 35 years. In addition to illustrating, she also writes adult science fiction novels under a pseudonym. Dandi resides in England and her illustrations have illustrated numerous children's books and adult publications. You can see more of her work on her website.